I love fruitcake. I am one of small coterie of people who actually love fruitcake. I will even eat those commercial cakes with gooey gobs of candied fruit suspiciously suspended in a dark brown batter, because I am not that discriminating when it comes to fruitcake. learning to like fruitcake is like learning to like haggis. Some of you have even heard there is really only one fruitcake in the whole wide world which is passed on as a gift from person to person every Christmas increasing in weight but never diminishing in size. Rumour has it, there is a family in Moosejaw, Saskatchewan, that owns an antique fruitcake. Every year they bring it down from the attic, dust it off, put it on the table for decoration and then pack it away until next Christmas. Cakes made with preserved fruit have been a Christmas Tradition since the middle ages. The dark cakes we now eat were once made with meat as winter blood puddings; the golden fruitcake come from the English tradition of yeast raised “great cakes” served at weddings and on feast days. The much maligned fruitcake is one of our oldest Christmas culinary traditions and it is one of those ritual foods you must have if you are going to celebrate the holiday properly. Fruitcake gets its bad reputation because so much of what is sold is really not very good. That is because commercial cakes made with cheap ingredients have ruined our idea of how glorious good fruitcake can be. Every autumn I look forward to the day I make fruitcake. It is not a particular day marked on any calendar but rather there is something in the air that says, “It’s fruitcake weather.” There are many variations of fruitcake – some made with currents, figs or almonds, or citron. 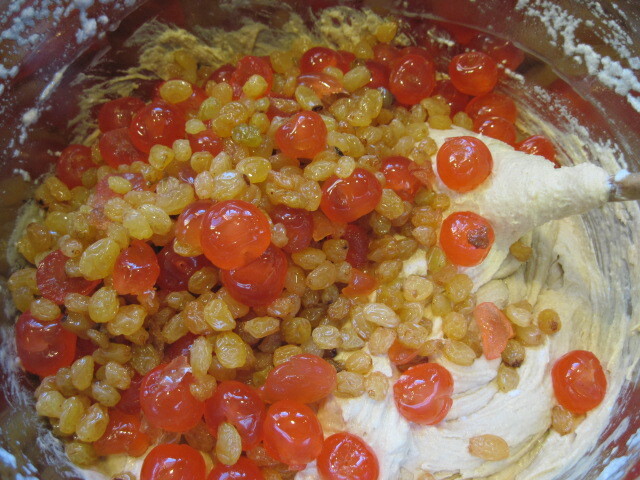 I make a “white” fruitcake so named because it is light in colour and uses golden raisins and whole red candied cherries. Only the best quality ingredients will do. When my sister, Kerry, went to school in Okmulgee, Oklahoma, she would send bags of fresh picked pecans and I would use these, all cracked by mine own hand, in my cakes. Now I use walnuts picked from a good friend’s majestic walnut tree in Summerland. Fruitcake cannot be rushed. It takes at least two days to make. Day one is spent simply marinating the fruit in brandy or sherry or what ever is your pleasure. My pleasure is Kentucky sour mash bourbon. The recipe I use is large. When I found this recipe in the 70th Anniversary edition of Red Book in (I believe) 1973, it was used for wedding cakes. 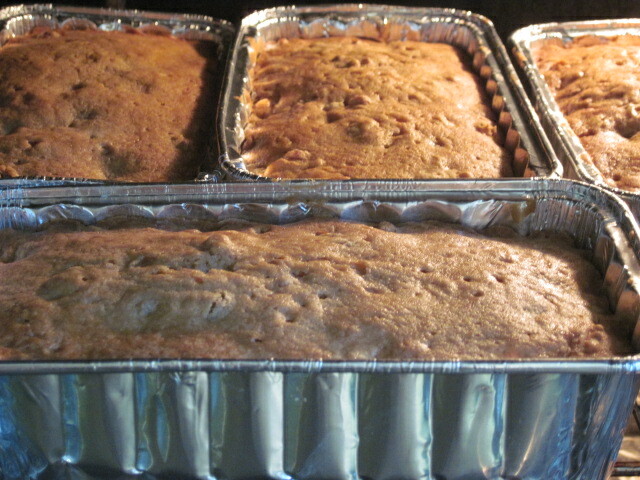 Fruitcake is baked in a slow oven. They are baked slowly and sometimes require sitting up late watching the oven door while baking. A large cake can take several hours. Once the cakes have cooled, I wrap them in cheese cloth and drizzle them with a few spoonfuls of sour mash bourbon. I then wrap them in tin foil and put them in a cool, dark place to marinate. 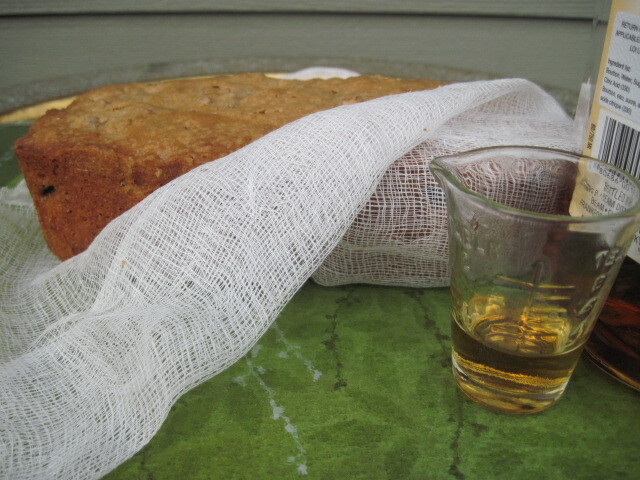 One of the ceremonies for tending fruitcake is the drizzling of the sour mash bourbon every week or so. The cakes sleep only waking up to the occasional bourbon bath. Fruitcake must age and mellow out for a minimum of one month but it will keep almost forever in a cool, dark place if well wrapped. Although, I have no personal knowledge of this as my cakes never last that long. When time comes to unveil the cake it will be the most delicious thing you have ever tasted. I was recently happy to learn that Her Majesty, Queen Elizabeth, always travels with fruitcake (Prince Philip??! ), which she enjoys with her afternoon tea. Go ahead. Try it; it is a cake of textures. Each piece a miniature stained glass window. See, if like me, you don’t develop a taste for it. After all, if it is good enough for Her Majesty, Queen Elizabeth, surely you owe it to yourself, your Queen and your country to give it another chance. 1. 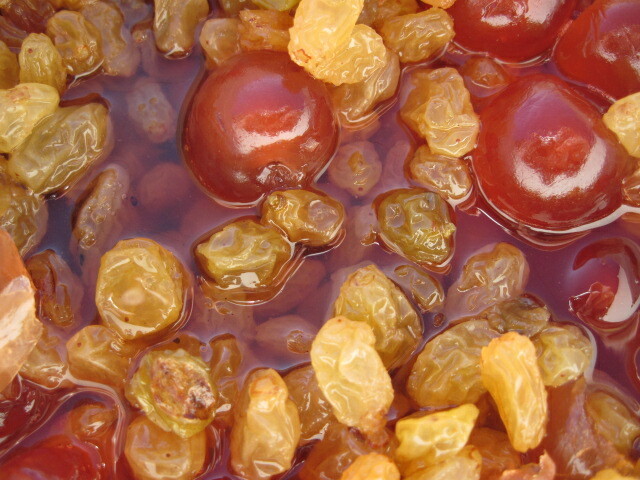 Combine cherries, raisins and bourbon in a large mixing bowl. Cover tightly and let stand over night. 1. You will need at least six mixing bowls! One bowl needs to hold 14 cups of batter. The bowl of my KitchenAid mixer is not big enough for the final mix up. 2. Prepare cake pans, what ever size you plan to use. If using tinfoil pans, simply grease. If using metal or glass, grease and line with parchment paper and grease again. Personal experience tells m eyou cannot eliminate this step. 3. Heat oven to 275. 4. Combine 1/2 cup of the flour with nuts. 5. Drain fruit reserving the bourbon. 6. In a large bowl combine remaining 4 1/2 cups of flour with baking powder, salt and nutmeg. 7. 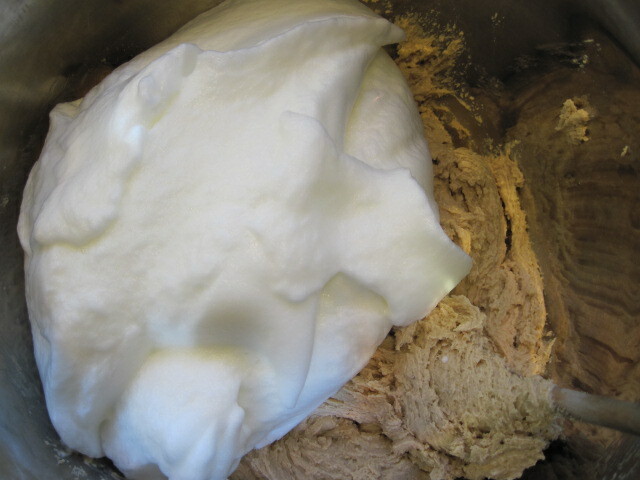 Put butter in your mixer bowl and beat until light and fluffy. Gradually add the sugars until well blended. Add egg yolks beating well. Add two cups flour mixture and mix thoroughly. Add bourbon and remaining dry ingredients alternately, ending with the dry ingredients. At this point, I scrape the batter into my 8 litre bowl. 8. Beat egg whites until stiff but not dry; fold gently into batter. 9. 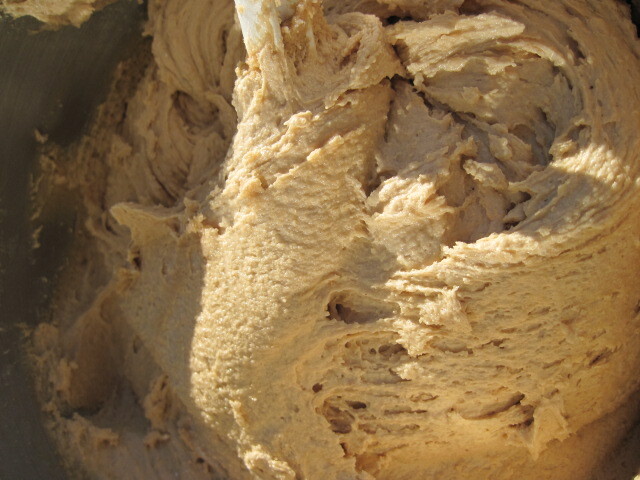 Add drained fruits and floured nuts to the cake batter and blend thoroughly. 10. Pour cake batter into prepared pans and put into the oven. 11. Bake for 2 hours or until a cake tester inserted in the centre comes out clean. Cool cakes in pans for 1o minutes; remove from pans and take off parchment paper. Cool completely. 12. Wrap cakes in cheesecloth and pour two teaspoons of bourbon on each cake. Wrap in tinfoil or plastic wrap and store in the refrigerator for several weeks. 13. Marinate the cakes once again with bourbon. Finally …go through your list of who is naughty or nice to find out who is fruit cake worthy. 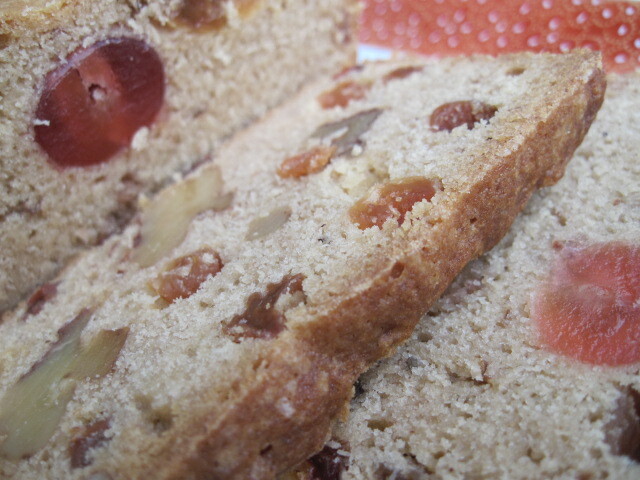 No point in giving your delicious creation to someone who doesn’t share your passion for fruitcake! My life isdivided into two parts…BF and AF…Before Fruitcake and After Fruitcake. My sister’s fruitcake that is. I look forward to receiving this every year at Christmas and if I have one complaint it is that I only get a very small cake. This year I will be out of the country and I am sure my sister thinks she can give my cake away to someone more cake-worthy than I (not hard to do) but I am challenging her theory that this cake will keep forever and to hold my cake for me until I return in the spring. So in the name of science, please don’t be giving my cake away!